Four years ago, we lamented the decision by Forbes to discontinue their annual Best Small Companies list. 36 years in the running, the list provided a number of actionable opportunities over the last couple of decades for many of us. That said, while sticking to their core criteria, we may have actually improved the discovery and screening process. 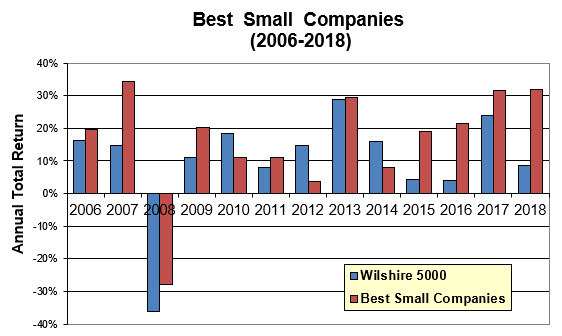 The Best Small Company tracking portfolio has now beaten the Wilshire 5000 in 10-of-13 years. The last four years have delivered 19.0%, 21.6%, 31.7 and 32.0% respectively. The 32.0% was achieved versus a Wilshire 5000 at 8.6% for 10/31/2017-10/15/2018. For 2006-2018, the average annualized return is 16.5% versus 10.2% for the total stock market. Note: The year-over-year results increased to 36% with the surge in the stock market on Tuesday. When thinking about our experience over the last four years since adopting the orphaned Forbes mission — essentially seeking excellent faster-growing companies through the eyes of George Nicholson — we might want to switch the name of this campaign to Better Small Companies going forward. As of 10/15/2018, the following (20) companies are on the “leader board” for the 2019 roster of Better Small Companies. Keep in mind that some of the fundamentals will be updated and price changes will cause some “drift”. We expect that 5-6 of these companies will be dislodged from the list as we complete the search for actionable ideas among the best-performing small company funds, Red Chip Review and American Association of Investors Shadow Stocks. Go ahead. Hug some red rabbits! Our Fave Five essentially represents a listing of stocks with favorable short term total return forecasts (1 year, according to Analyst Consensus Estimates, or ACE) combined with strong long-term return forecasts and good/excellent quality rankings. The median 1-year ACE total return forecast is 12.6%. This week we swing for the fences. The only restriction we placed on the long term perspective was to require that the stock be in the sweet spot (or above) with a minimum quality ranking of 60. So we’re looking at good or excellent companies with — in some cases — exorbitant long term forecast that also have out-sized total return forecasts for the next year or so. Amira Nature Foods (ANFI) is a repeat participant. ANFI was added to the tracking portfolio back in June 2017 and was “expelled” for dropping more than 20% versus the market in fairly short order. The price at the time was $4.21, so today’s current price of $2.30 is 45% lower than that exit point. 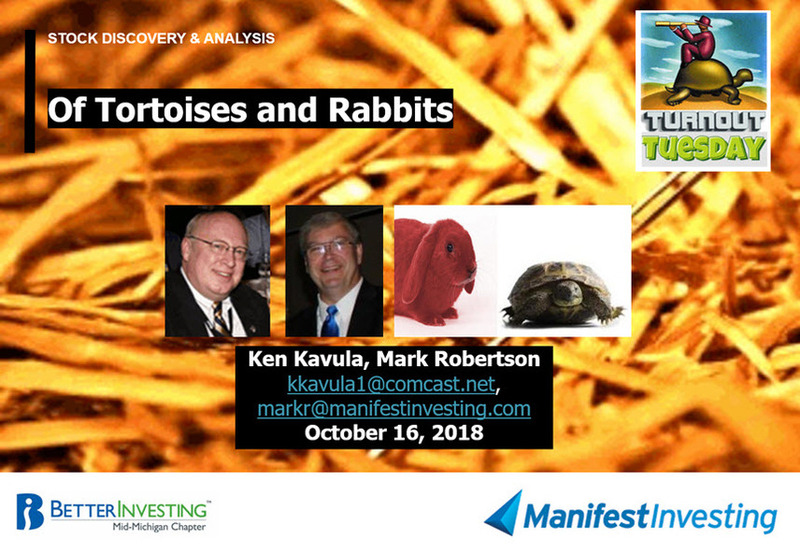 This is a potential example of the Rule-of-5 sell discipline that Ken Kavula and Mark Robertson discussed and presented at the NAIC national convention. Suburban Propane (SPH), Health Insurance Innovations (HIIQ) and Grupo Aeroport Pacifico (PAC) are new additions. Suburban Propane is a Master Limited Partnership and should be viewed as a more suitable individual portfolio component. See: Investing in MLPs (Source: bivio.com, Laurie Frederiksen) MLPs are generally challenging for club/partnership portfolios. Health insurance is a mess. Perhaps it’s a field of opportunity. HIIQ could be worth a study to see if they’re making gains and solving the Rubik’s cube. Long & Short Term Perspectives. (May 18, 2018) Projected Annual Return (PAR): Long term return forecast based on fundamental analysis and five year time horizon. Quality Ranking: Percentile ranking of composite that includes financial strength, earnings stability and relative growth & profitability. 52-Week Position: Position on scale between 52-week low price and 52-week target price. VL Low Total Return (VLLTR): Low total return forecast based on 3-5 year price targets via Value Line Investment Survey. Morningstar P/FV: Ratio of current price to fundamentally-based fair value via www.morningstar.com S&P P/FV: Current price-to-fair value ratio via Standard & Poor’s. 1-Year ACE Outlook: Total return forecast based on analyst consensus estimates for 1-year target price combined with current yield. The data is ranked (descending order) based on this criterion. 1-Year S&P Outlook: 1-year total return forecast based on S&P 1-year price target. The relative/excess return for the Fave Five tracking portfolio is +2.6% since inception. The absolute annualized rate of return is 16.6%.